Ajanta Spanish in Two Months (through the medium of Hindi -English) is ideal for travellers, students and general public. The author of Ajanta Spanish in Two Months is extremely grateful to Sr. Jose L. Barron, Charge d' Affaires, Embassy of Spain, New Delhi for appreciating his book of Spanish. The writer of this book is also grateful to Dr. Antonio Binimilis Sagrera, Ex. Professor of Spanish, Centre of Spanish Studies, Jawalharlal Nehru University & Delhi Unversity for appreciating his Spanish book. Spanish is the most widely spoken language among the romantic branches of the Indo­-European languages. Language of love, literature and passion, it is spoken by more than 300 million people in the world. The importance of Spanish in the world is very high due to the growing economical power of Spain (8th highest world economy) and other countries. As a result, learning Spanish has become a fashion all over the world. This book has been written by Rashmi Varma and Diego A. Agundez, who have considerable experience in teaching foreign languages and have also authored French Made Easy and German Made Easy in this collection. The book is ideal for those who are learning this language without a teacher. The idea of this was never to be an in-depth study of the language; but rather, a brief on the pronunciation and grammar, and a collection of set phrases which would help the readers while travelling around the world. Language learning should be quick, fun and easy! This book provides you with the vocabulary with which you can create new sentences, sentence patterns, correct pronunciation and dialogues, which will help you communicate in different situations. 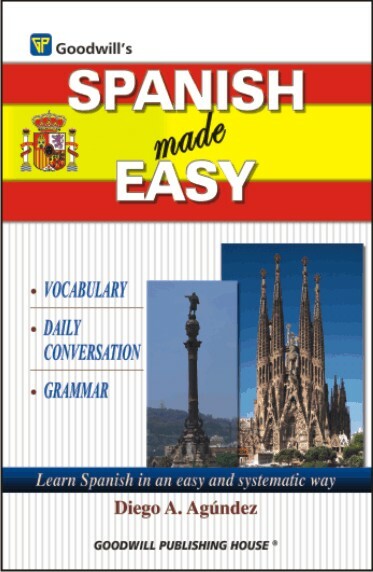 Whatever has motivated you to learn the language, SPANISH MADE EASY will help you to achieve these goals.